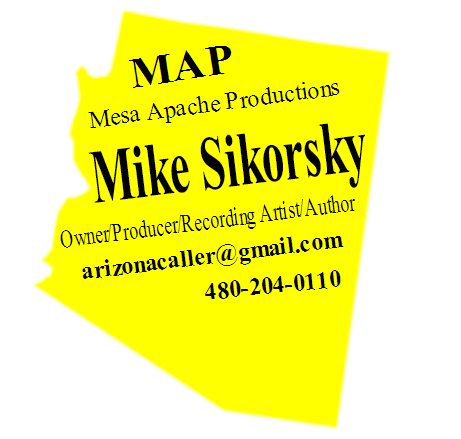 The Official Mike Sikorsky Web Site! Subscribe to the MapMusic email list and be notified when new MAP releases are available. You can always nav to www.mapmusic.biz and listen to the sound clips. MAP produces hoedowns and singing calls you and your clientele will truly enjoy. All MAP music may be purchased by clicking on the Add To Card buttons under each song title. Music sold on this page is mp3. Scroll down this page to listen to MAP Music! Now! Your dancer clientele will appreciate you! All hoedowns and singing calls listed below are available in both instrumental-only versions and also versions called by Mike Sikorsky. The called and instrumental-only versions of each hoedown and singing call listed below are both sold to you for one price. If the shopping cart does not appear to work, click here to go directly to our frameless MAP Shop page. Darby Love calling "Bad Bad Road"
​Young Bunch caller Faith Brooks calling "Bubbly"
​Misha calling "Bad Bad Road"
Mike Sikorsky calling "My First My Last My Everything"
www.squaredancing.net is where to find all Mesa/Apache winter square dance info. Join us this winter!